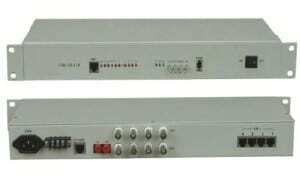 AN-DV1000 series VoF unit can transmit 1 line bidirectional digital video broadcasting, 1 line bidirectional high-fidelity audio, 1 line bidirectional asynchronous date,1 line 10/100M adapt Ethernet date to one fiber efficiently. 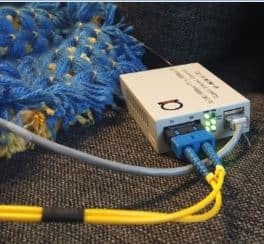 Simple application scenarion – 2 Video channel unit, at other side can be connected to DVR recorder or monitoring devices. AN-DV1000 series video fiber converter supports any high resolution dynamic or stationary picture high-fidelity transmit. It also can be anti-disturbance against several signals, environment, and work stably. It is widely used in security monitoring and control, high way, electronical policy management, automation control, intelligent residential districts and so on.